Digital signals are sequences of numbers. The index in the sequence acts as time. 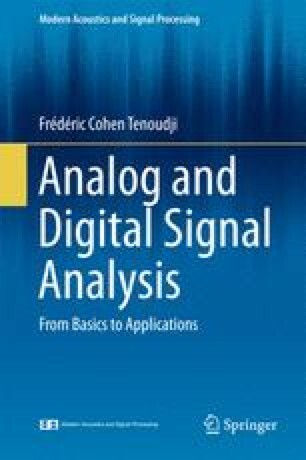 Digital signals may be purely synthetic (calculated algorithmically) or result from the conversion of analog signals by Analog/Digital converters. Digital signals possess several advantages compared to analog signals: First, their treatment is more flexible. Processes on digital signals can be achieved that are impossible for analog signals. In this chapter, we first give some idea of the analog to digital signal conversion and the error committed during this operation conditioned by the limited resolution of the converter. We show then, with a simple example, the necessity of using a sampling frequency of the analog signal that is sufficiently high so that rapid variations of a signal can be correctly rendered in the digital signal. We also show with the simple example of digitizing a sine function how a frequency component higher than the sampling frequency can have the same digital image as a low-frequency signal caused by a stroboscopic effect (aliasing).